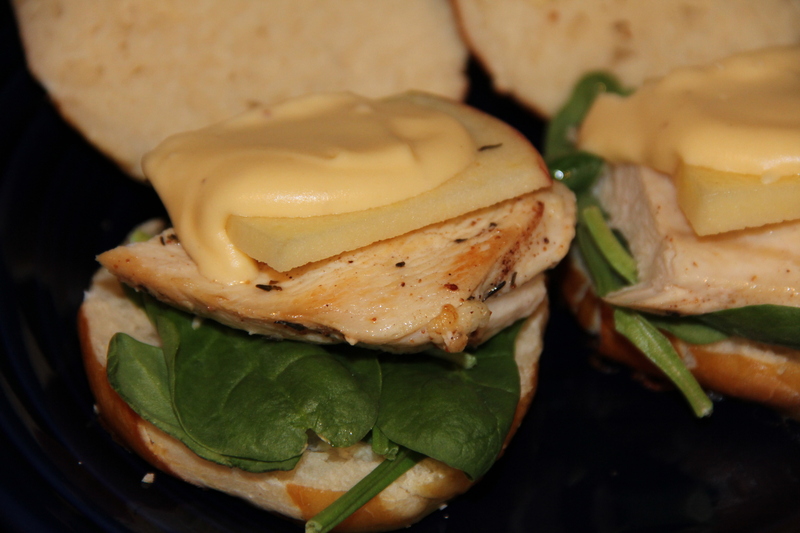 I usually don’t try out recipes before an event, yes I know I live on the edge, but when it is a delicious cocktail, well reserch is important. 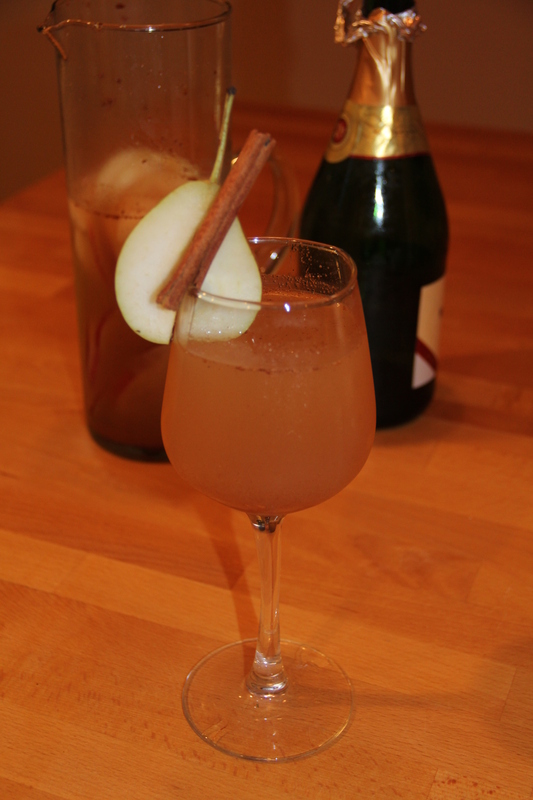 I was trying to think of a festive drink for Thanksgiving, I’ve done cranberries and pumpkin in the past so I was thinking of something new and different. Apples? hmm too boring how about pears? 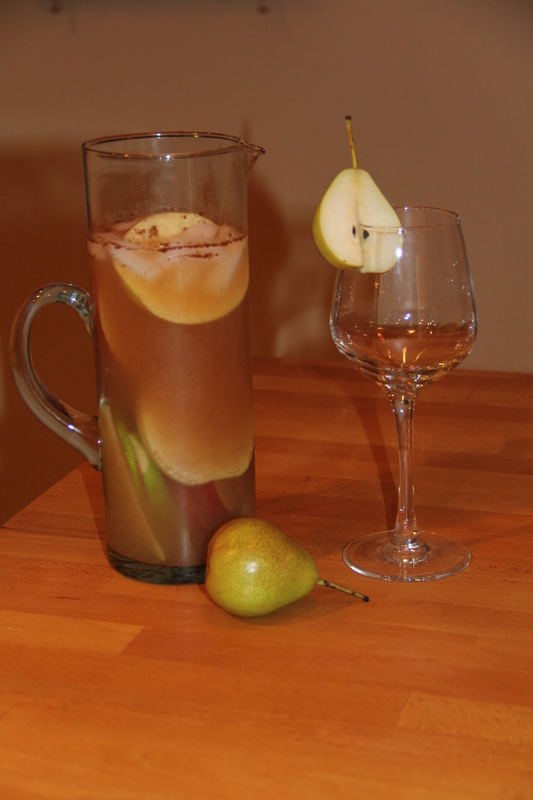 So I came up with a spiced pear sangria. It’s very yummy and I am glad I practiced first. 3 c champagne, prosecco or sparkling wine. 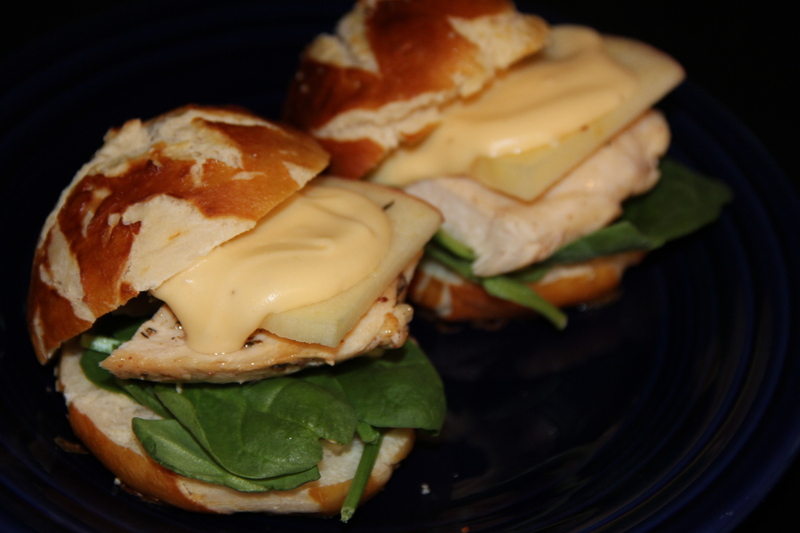 Garnish with cinnamon sticks and or sliced pears. 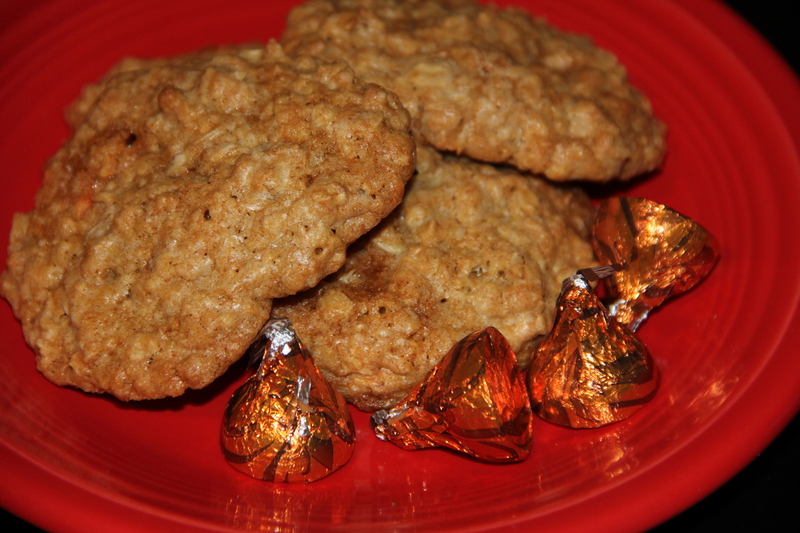 I bought a bag of the pumpkin spice Hershey’s kisses and liked them but thought these would go great with an oatmeal cookie, and so the idea was born. 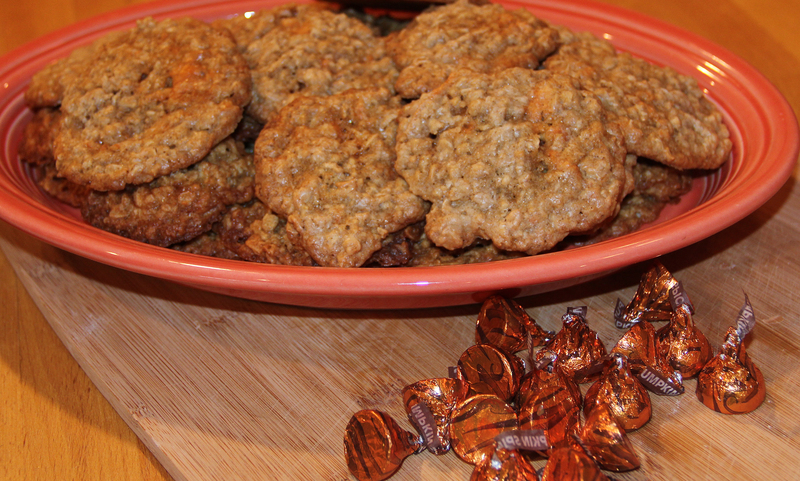 I made them and even my finicky kids who aren’t crazy about oatmeal cookies devoured them. 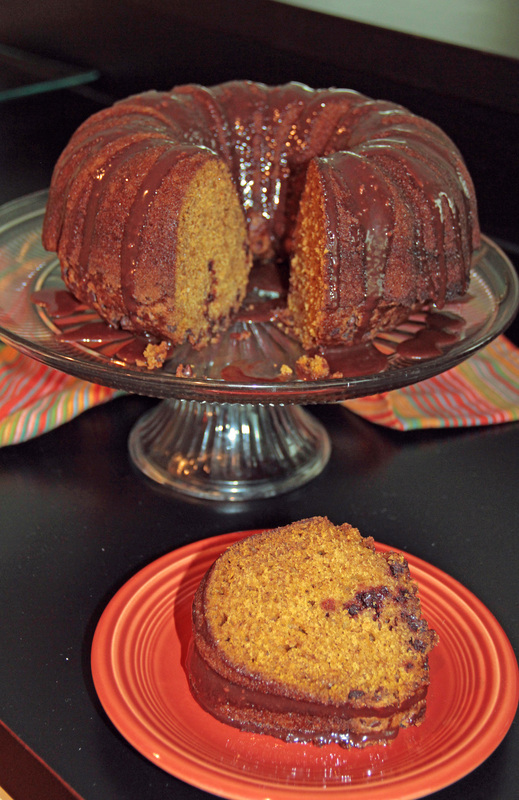 Shh don’t tell but it’s my new favorite fall breakfast , sweet with a touch of spice. 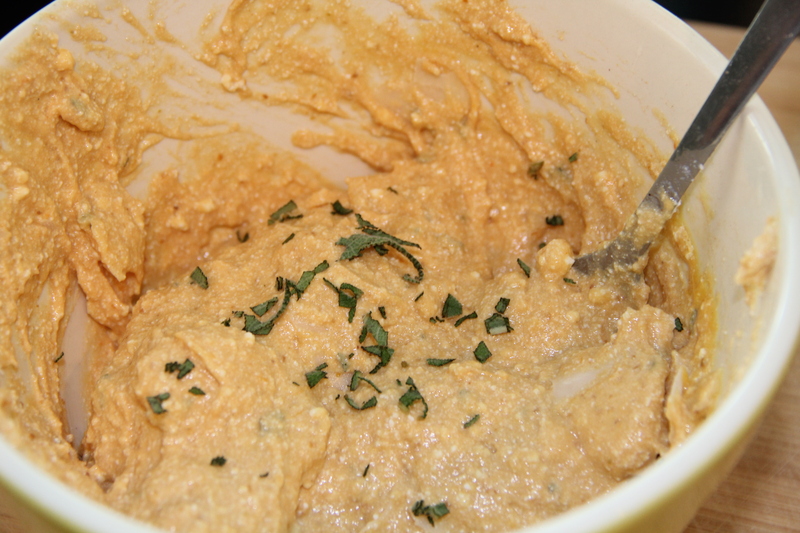 In a medium bowl combine oats, flour, baking soda, nutmeg and cinnamon. Slowly add this to the butter mixture, mix until well combined. Stir in Chopped kisses. ( I refrigerate my dough for about 10 minutes, this keeps your cookies from spreading and becoming too thin while baking) Drop 1 T rounds onto a greased cookie sheet. Bake for 12-14 minutes. Let cool, store in an air tight container. 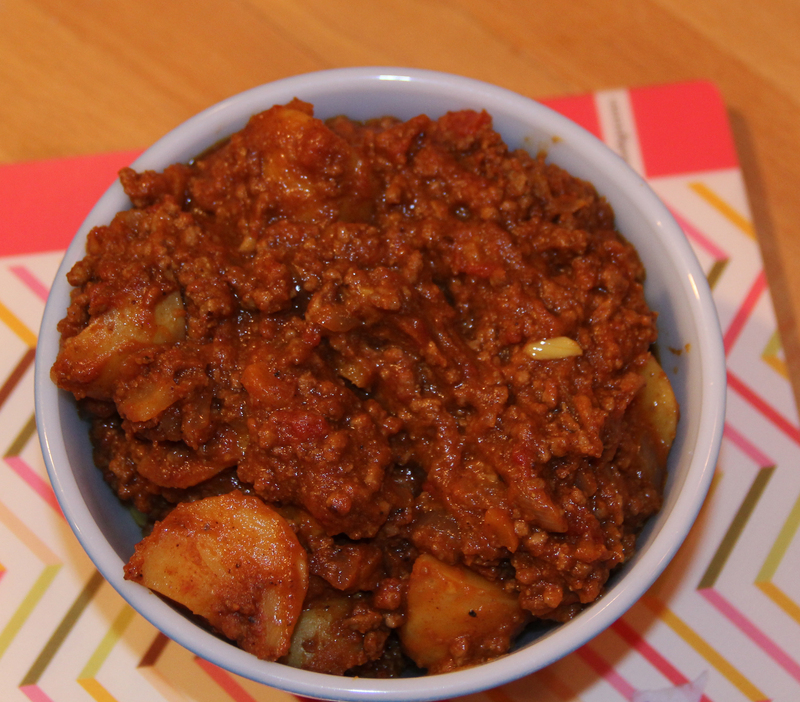 Get out the spice rack, this thick and satisfying chili has a great depth of flavor, warm, hearty, earthy and spicy. 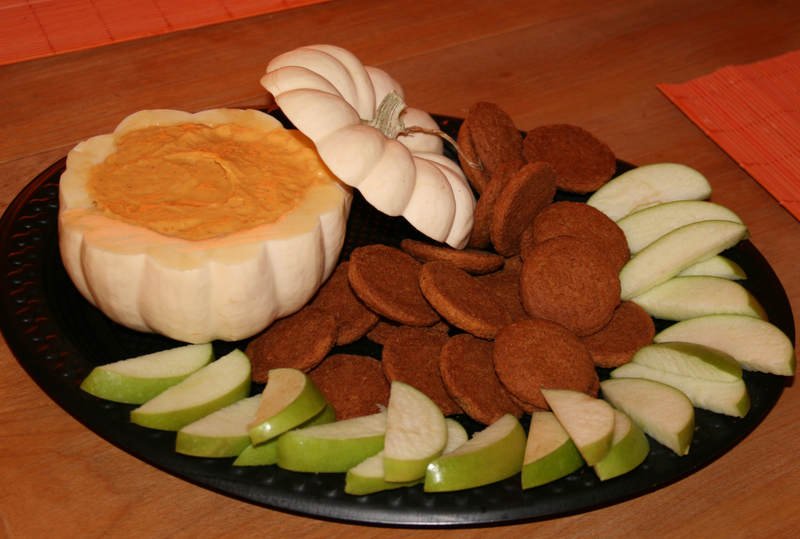 Perfect for Halloween night or any fall dinner, serve it with naan or couscous. 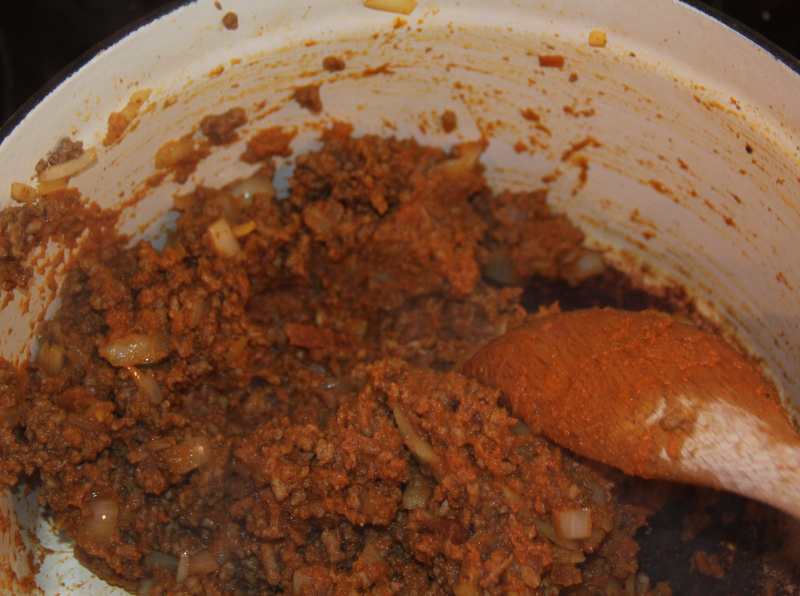 In a large heavy pot brown ground beef over med high heat until cooked through, add, all the spices, tomato paste and honey, stir and cook 1 min, add garlic and onions, cook 2-3 minutes more, stirring constantly. 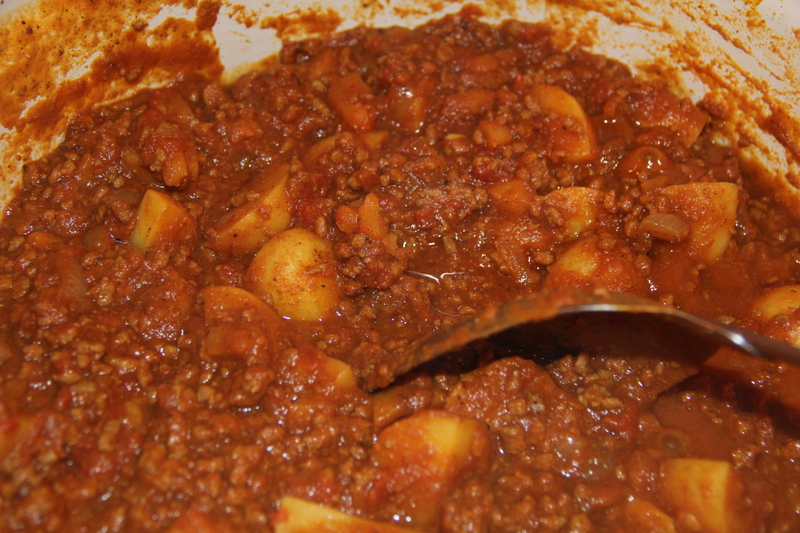 Add pumpkin, apricots, tomatoes and potatoes, stir, add broth and bring to a boil, cover and reduce heat. 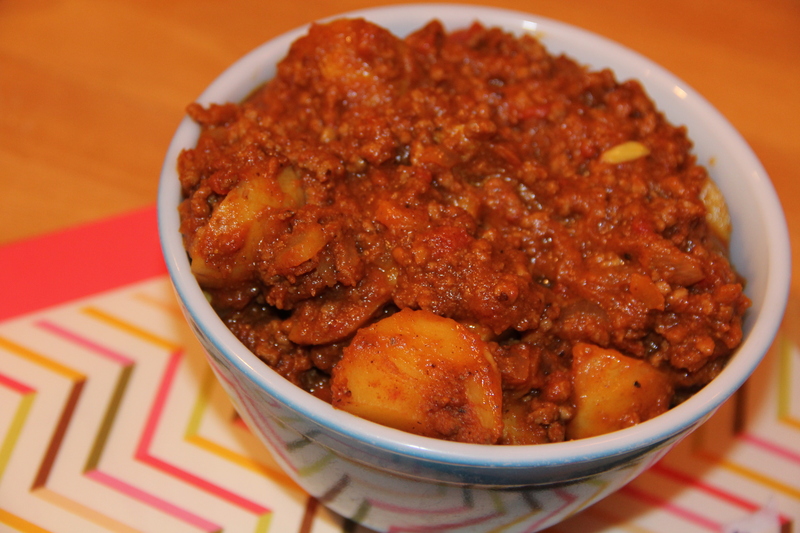 Cook for 20-30 minutes or until potatoes are tender. 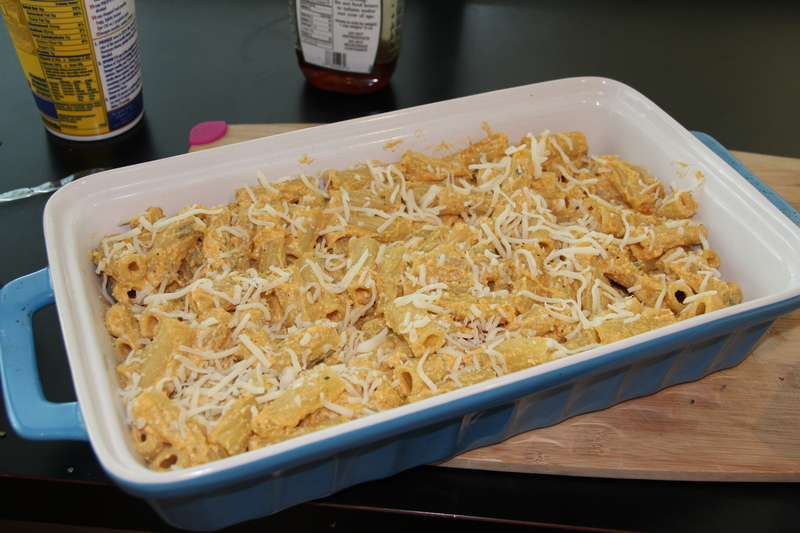 Fall is here, time to use one of my favorite seasonal ingredients, pumpkin. Pre heat oven to 350 degrees. Grease and flour a large bundt cake pan. 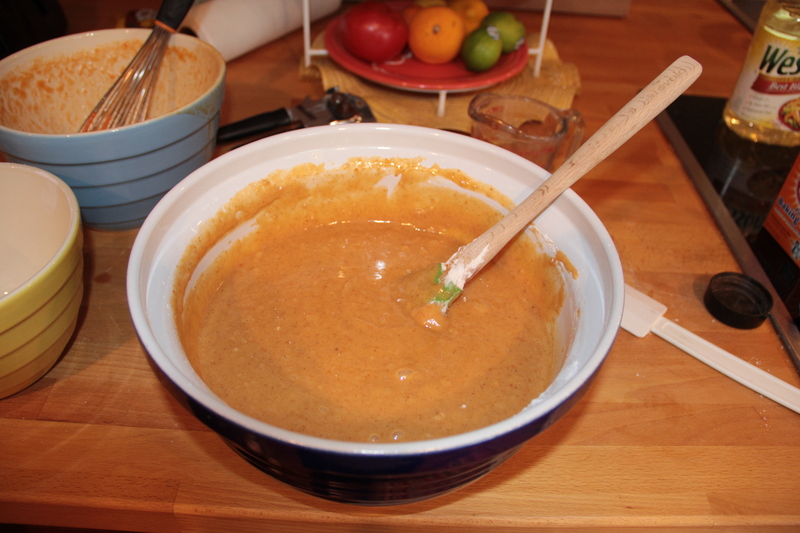 In a large mixing bowl whisk together pumpkin, eggs, oil, water, vanilla and sugar. 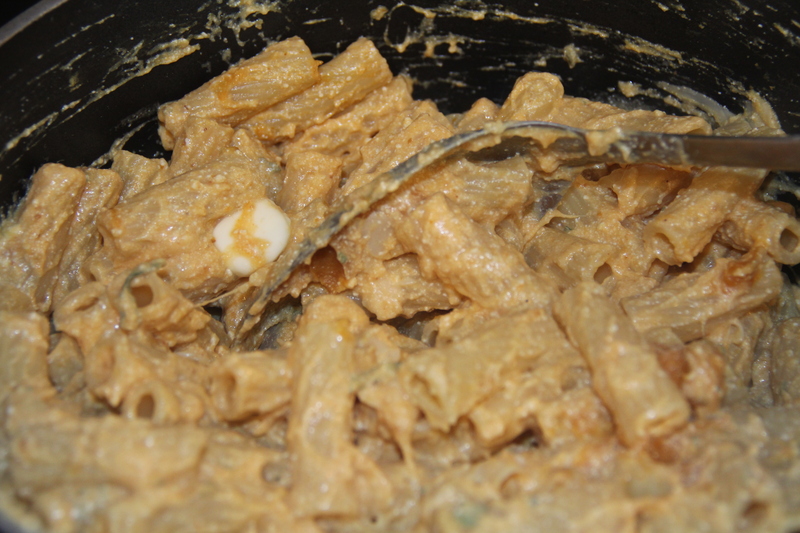 In a medium bowl stir together, flour, baking soda, salt and spices. 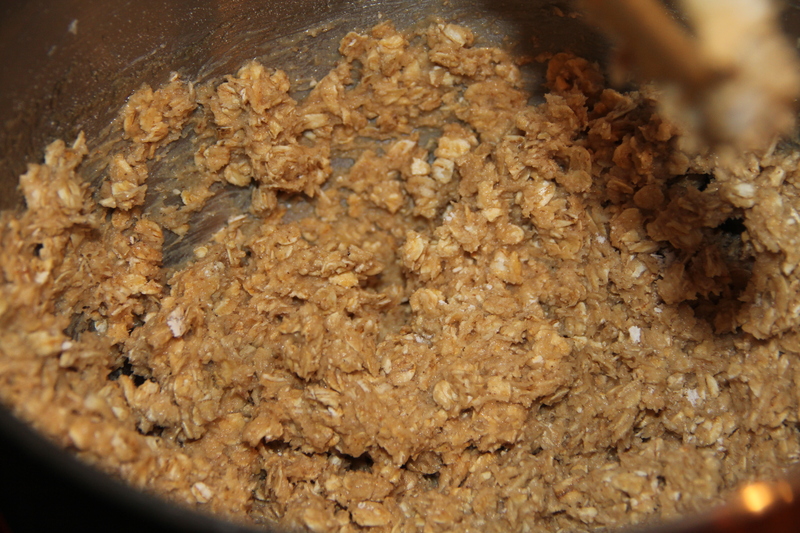 Add dry ingredients to wet gradually stirring until smooth. 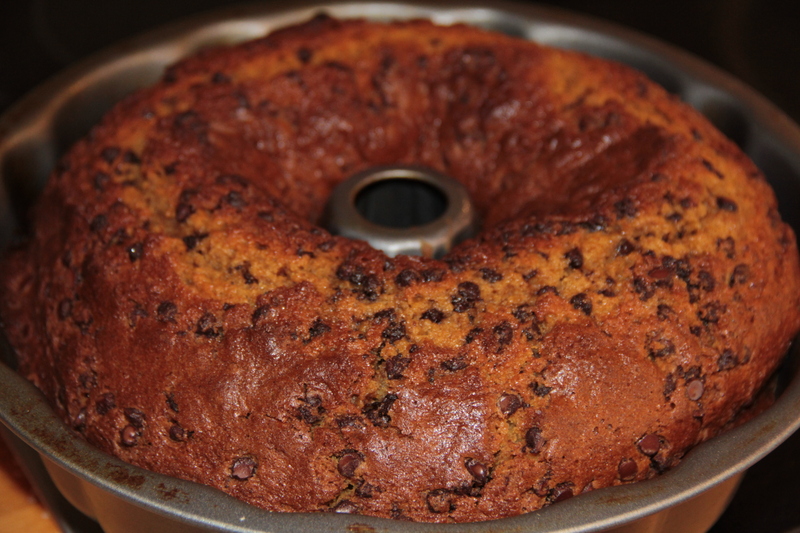 Add chocolate chips and pour into prepared bundt pan. Bake in oven for 50 minutes or until a wooden skewer inserted comes out clean. Let cake cool in pan. 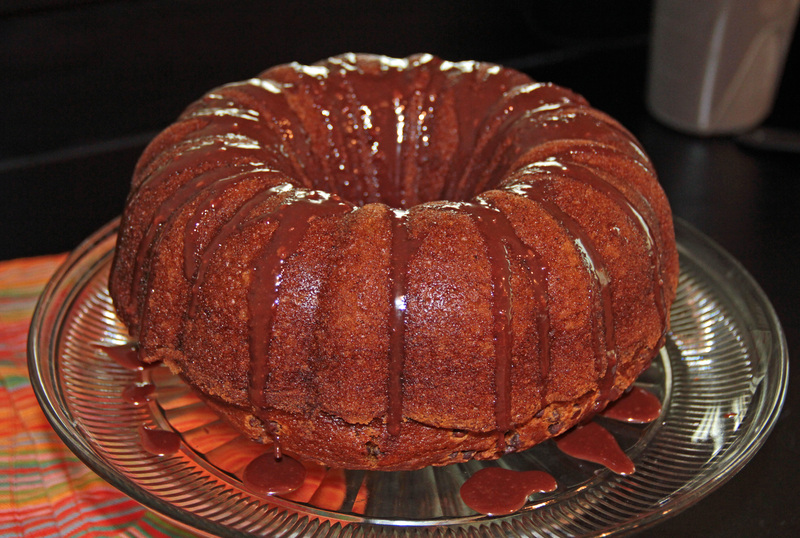 Meanwhile make Nutella glaze by whisking together Nutella, powdered sugar and milk. 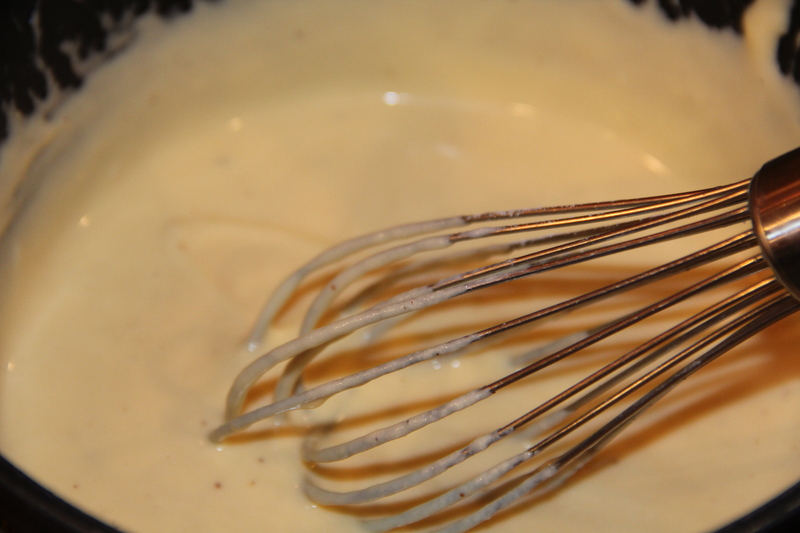 Add milk a tablespoon at a time until desired consistency. When cake is cool invert onto a plate or cake stand. Drizzle glaze over top and serve. 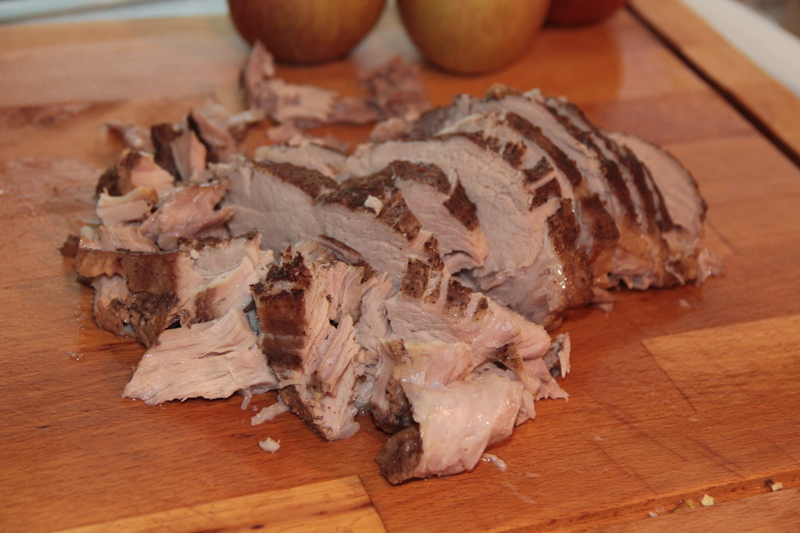 What is a more classic combination than pork and apples? 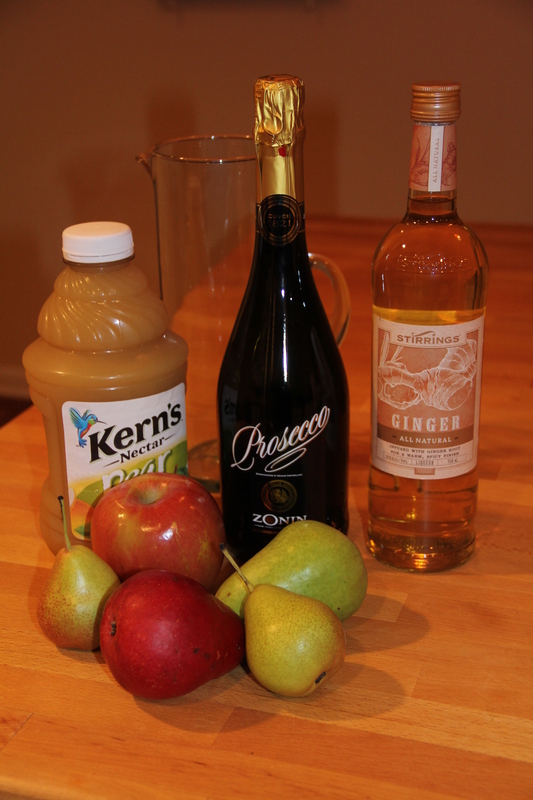 This is an updated version of pork chop and applesauce night. It’s made in a slow cooker and has a beautiful, savory ,and delicate flavor of apples and ginger. 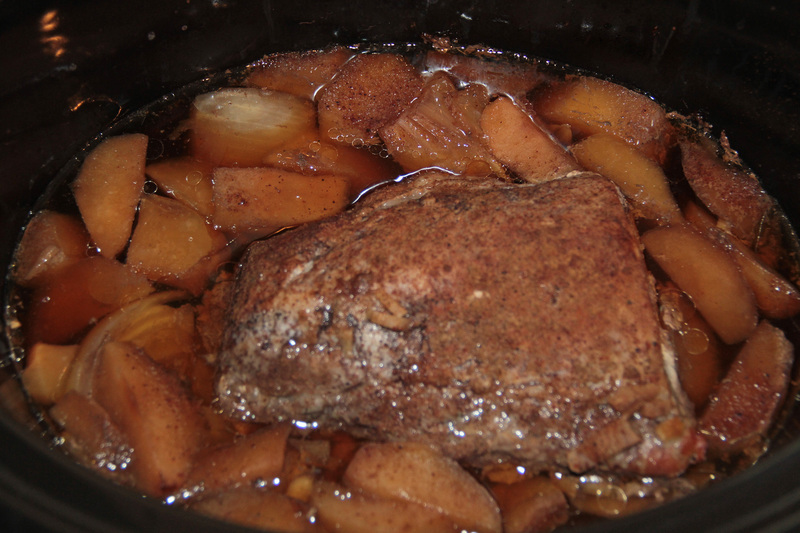 Add roast, apples, onions, garlic and ginger to a large crock pot / slow cooker. Add soy, chicken broth, vinegar and spices. Turn on high, cover and cook for 4 hours. 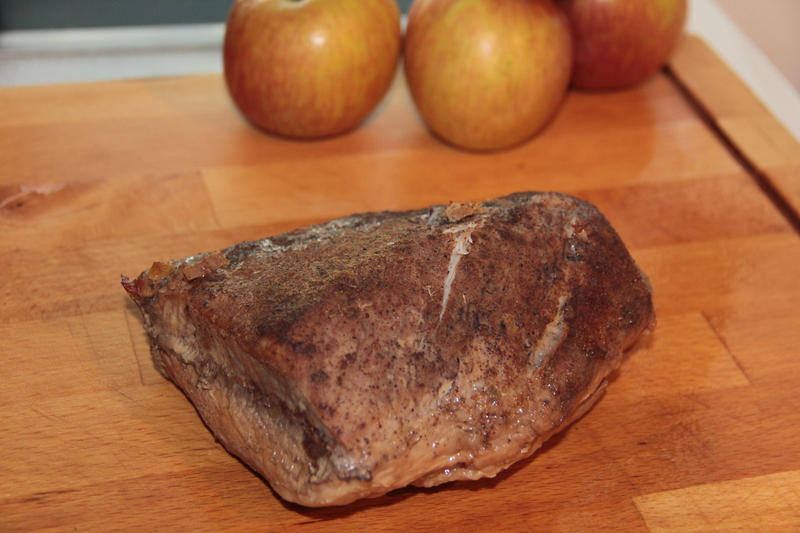 Remove Roast and slice, meat will be very tender. 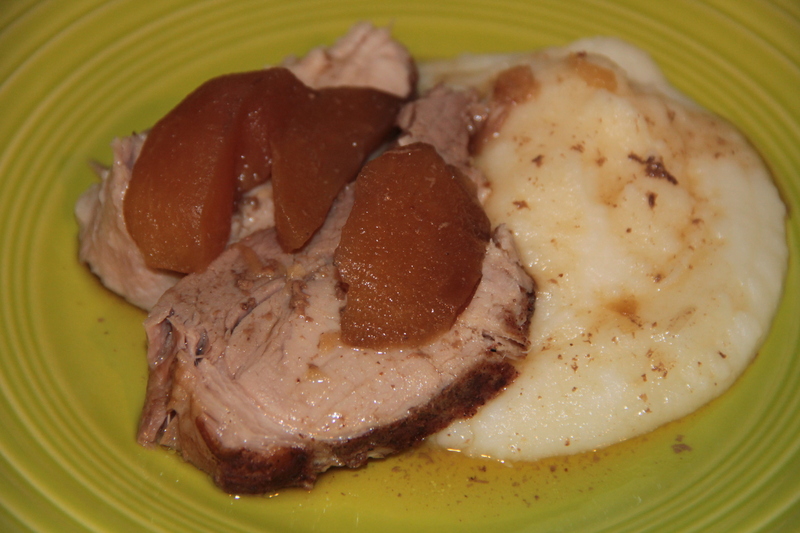 Serve, I served mine on top of mashed potatoes and served the au jus and apples from the pot over the top. We recently took a little trip down to Boca Raton, Fl and happened upon a cute little Jamaican bistro called Rock Steady Jamaican Bistro. The food and service was excellent. 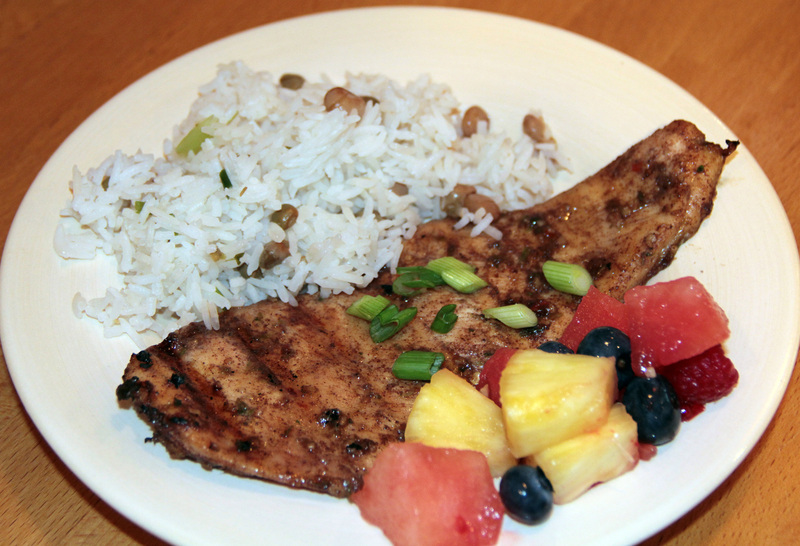 I love a good jerk and the spicy, sweet, fresh flavors of Caribbean cuisine, luckily so do my kids. I realized I don’t make enough of this at home, time to change that. I have used the dry jerk seasoning from the spice aisle at the grocery store but it just doesn’t cut it. Time to try my hand a a real, wet, jerk, marinade. I think it was a hit, it had all the flavors I was looking for. Unfortunately neither my local grocery or produce stand had scotch bonnet peppers so I used fresh jalapenos from my garden. I think it still tasted fine but if you are going for authentic switch out the jalapenos for scotch bonnets, just remember they are much spicier so use half the amount. 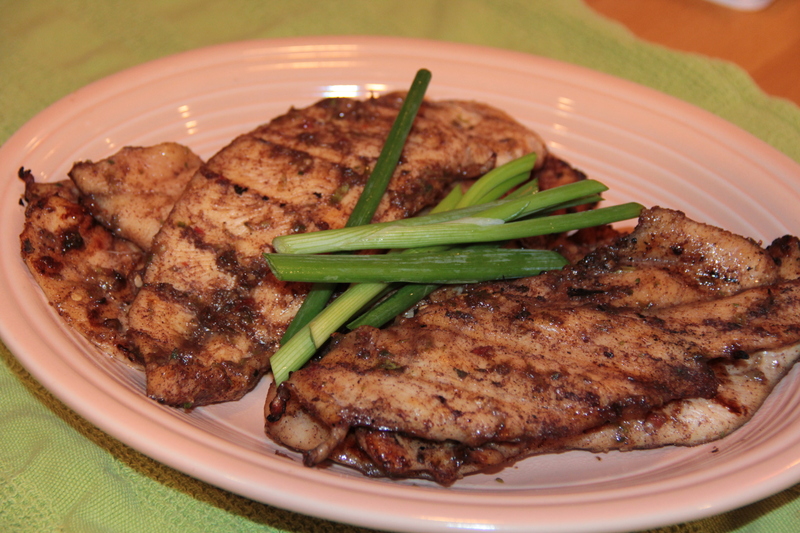 Pour marinade over 1 1/2 pounds of pork, shrimp or chicken. 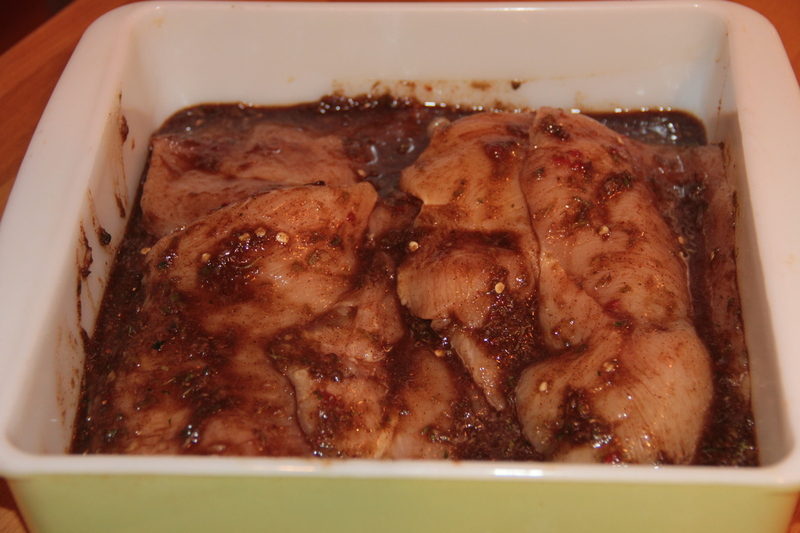 Marinate in the refrigerator for at least 30 minutes. I used chicken cutlets and grilled them over high heat for about 4 minutes per side. 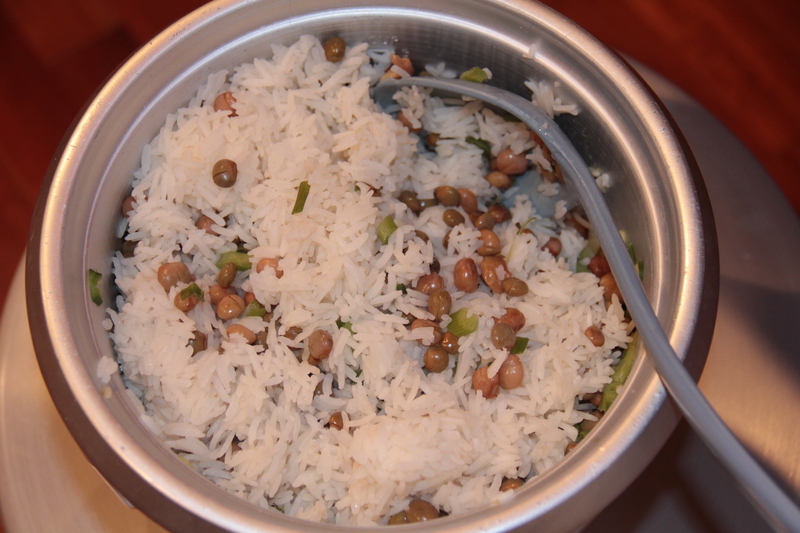 A traditional side in Jamaica is Rice and pigeon peas. Pigeon peas come in red and green and can be found in the ethnic food section of the grocery store. They are not sweet like english peas but more like a legume, or small red bean. 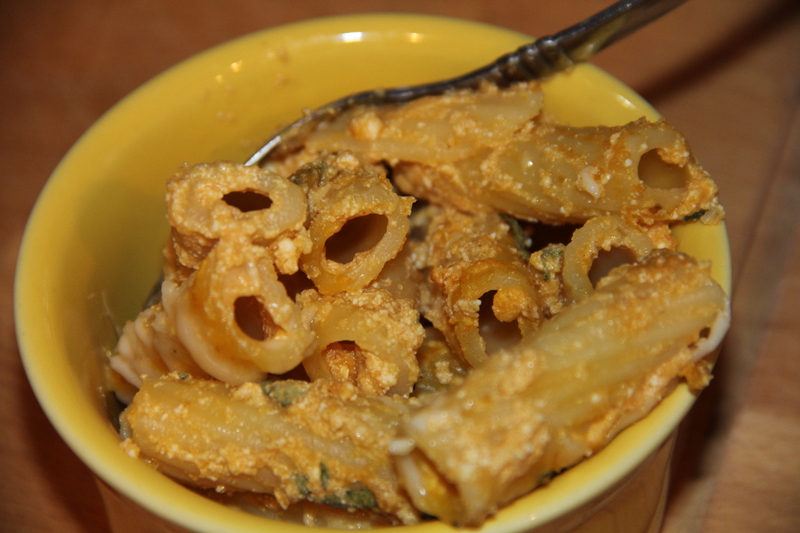 This easy recipe is made in a rice cooker. 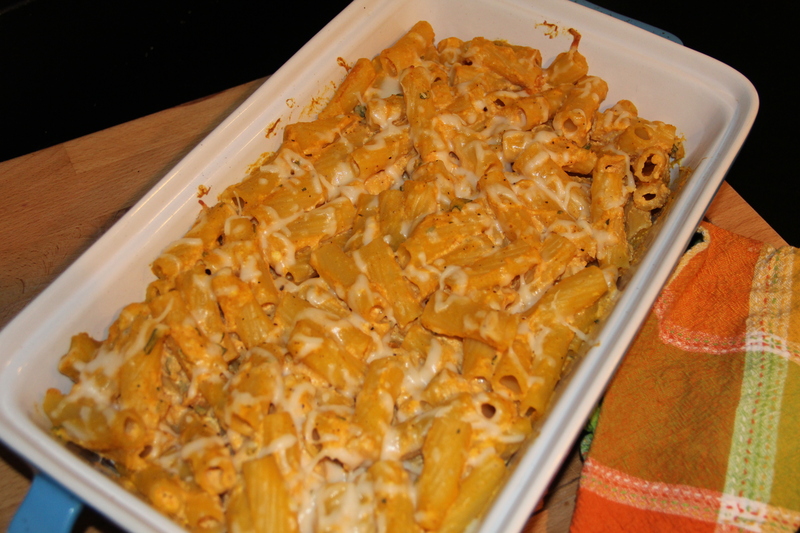 Place all ingredients into a rice cooker, and cook until done. Serve with a sweet fruit salad to balance out the heat of the Jerk and enjoy a little taste of the islands without leaving home.